Level 6: The TWO DAY RUSH Canopy Tour Course. The Two Day Rush at Banning Mills is the ONLY way to do our entire zip line course WITHOUT having to do anything twice! In the Zip Line world, IT DOESN’T GET ANY BETTER THAN THIS! The Two Day Rush is 16 hours of extreme zip line adventure. Enjoy 100 zip lines, 72 sky bridges, and if there’s time left, anything else you would like to do again! We are the only zip line course in the world that offers a tour like this! 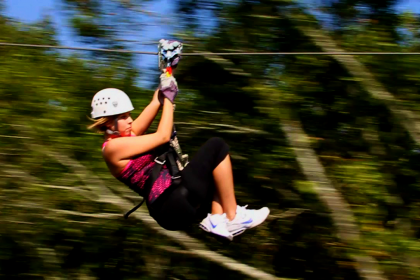 Swoop Zip Line: 900 foot, high-speed extreme zip line! Fly down the middle of beautiful Snake Creek over the rapids! High Traverse Sky Bridges: Sky Bridge traverses that are 60-100 feet high over the rapids of Snake Cree and/or in the trees. A beautiful eco-trek! Sky Trek Bridge: 600 feet long and over 180 feet high (18 stories) over Snake Creek Gorge. No other sky bridge in North America is like this! Two Springs Tour: Another 22 zip lines over the water! We are the only zip line course in the world that can offer this! Enjoy eight hours, up to 60 different zip lines and 47 sky bridges (out of 107 and 72 sky bridges). Open all year, we are the BEST VALUE in the zip line World! PLEASE NOTE: At this time, discount codes do not work for ONLINE RESERVATIONS. To use a code and receive your discount, please call.